The easiest way to get here. Either by car or using public transportation! A total of 1,500 complimentary parking spaces make shopping here more enjoyable. From downtown Hamburg or Bergedorf, take Bergedorfer Landstraße (B 5). Schiffbeker Weg leads to Billstedt Center Hamburg from the north, and Möllner Landstraße leads here from the northeast. If coming from the A 1 / A 24 freeways, please take exit 33-HH-Billstedt. 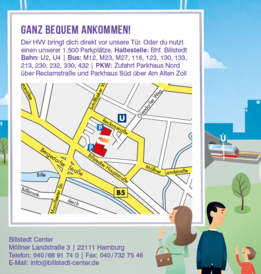 Hamburg’s transport authority HVV will take you to right outside our front door. Click here for your personal timetable.